Defining whether a building material is "green" is not an exact science. But there is still a role for objective analysis, comparison of materials and the discussion of testing methods. VEKA is a German based, privately held, multi-national corporation with extrusion facilities in many countries. As such we have greater control over our business operations and the corporate culture, which is to think globally and act locally. To that end we are careful to mind not only the profitability of the business but to act as a responsible member of the communities in which we live and operate. We have found that economic health and environmental/social concerns are not mutually exclusive. VEKA has created the dedicated position of Safety & Environmental Manager with the responsibility to constantly review our operations for safety concerns and process efficiency. We have found that improved safety, productivity and resource use can and does reduce overall operating costs while minimizing strain on local infrastructure and ecosystem. Vinyl is a versatile material because PVC resin can be combined with many performance additives and modifiers. 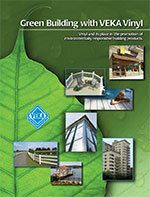 Vinyl is a highly efficient user of natural resources and saves resources and energy during its life cycle. Its fire performance is well known and well tested and vinyl scraps can be recycled after construction or demolition to be used again. VEKA recycles some in-house vinyl scrap into products produced for the outdoor living products division and into non-critical PVC shapes, such as our bundle box packaging for smaller shapes. VEKA ships finished profile in returnable steel racks. These racks safely transport product and serves as a convenient storage system for our vinyl lineals at the customer's fabrication facility. We encourage customers to use cut-offs (scrap) to manufacture other saleable products such as birdhouses, planters, benches, trellis etc. This generates more money than scrap buy back while reducing overall waste.